Electric Heat Pumps produce a most efficient form of heating, with some models offering the advantage of reverse cycle operation for both heating and cooling functions. Although they have a high upfront cost compared to other heat sources, heat pumps compensate this with the benefits that they offer, including energy efficiency and the flexibility of being used for both water and space heating through the one hydronic heating system. This article provides an overview of the main benefits and performance features of heat pumps when combined with hydronic underfloor heating. Heat pumps and electric resistance heating elements both consume electricity to heat living spaces. Resistance heaters are 100% efficient by converting energy directly, but they only provide one watt of heating per watt of electricity consumed. On the other hand, heat pumps use an inverse refrigeration cycle, offering three or more heating watts for each watt of electricity consumed. This ratio of heating or cooling output to electric power is called the Coefficient Of Performance (COP). The reality is that your heating can remarkably be over 300% efficient. The latest heat pump models deploy variable-speed inverter technology to achieve an amazingly high efficiency. Heat Pumps are now available with a COP above four, which is equivalent to energy savings of over 75% compared to resistance heaters, which equates to being over 400% efficient. Energy generation has a carbon footprint, and although renewable sources greatly diminish it, they still have an environmental impact at least during the manufacturing and construction stages. Upgrading to a heat pump has a positive environmental impact for the simple reason that it can provide the same energy output of a gas or resistance heater with a greatly reduced energy input and therefore at an attractively lower running cost. When a heat pump replaces a resistance heater, it is contributing to emissions reduction at power plants; and when it replaces a gas boiler, emissions are eliminated locally. In both cases, there is a significant environmental benefit. A single hydronic heating system can combine heating under the floor, wall mounted panel radiators, and bathroom towel rails. It can also supply other needs, such as Domestic Hot Water (DHW) and swimming pool heating. Often it is better to heat a ground floor level with under floor in-slab hydronic heating then, where the upper floor has timber joist floor construction, this heating can be with radiators connected to the same hydronic system. Other than energy efficiency, heat pumps can offer the advantage of combining cooling and heating into a single piece of equipment. 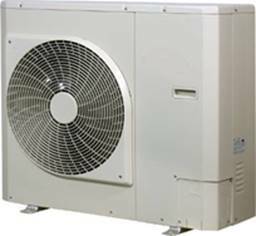 When in cooling mode, the operation of a heat pump is similar to an air conditioner. Another advantage of hydronic heating systems is that they can be equipped with a conventional gas-fired boiler as backup. This ensures the hot water supply will not be interrupted in case there is an electrical supply interruption. Conventional heating systems are based on forced airflow which can be noisy and create an uneven heat distribution through indoor spaces. This can be less comfortable, drying the air and stirring up dust that can create discomfort for allergy suffers. A heat pump with hydronic underfloor heating offers silent operation in the heating zones and distributes radiant heat evenly through indoor spaces. Hydronic underfloor heating includes the natural convection of warm air instead of forcing it to circulate with a fan, but the prime heating is radiated from the floor which is the most comfortable form of heating. Because there is no need to heat the air then a comfortable level of heating can be achieved at a lower energy cost. Heat pumps have an average life expectancy of 15 years, and warranties of up to 5 years are available. When combined with hydronic heating, heat pumps can satisfy multiple applications in a single system, greatly reducing maintenance expenses and the cost of ownership. Heat pumps with hydronic underfloor heating are highly recommended in new constructions, avoiding expensive upgrades in the future.